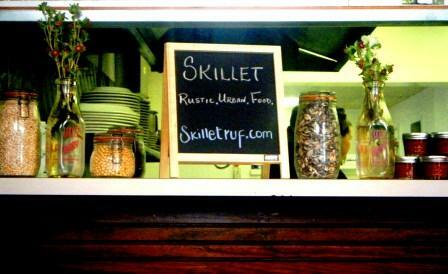 “Eat at a Locally-Minded Restaurant”: Let’s go to Skillet! A great suggestion for one of the things you can do to participate in local foods week is eat at a “locally-minded” restaurant. So to make sure we touched as many points on the Eat Local Challenge Pledge Card as we could this week, my family visited the cheerful Caskey family at Skillet for lunch today. Even home-body Persephone loves a good meal out. Hades started with the Red Beans and Rice. Chef Kevin Caskey really nailed the smokey, French Quarter flavor of this creole classic. Sadly, we dug in too quickly and have no photo to prove its existence. Mommy told Cherub the grilled cheese was a real winner. So she ordered the grilled cheese and pumpkin and black bean soup for herself (she’s a very confident three-year-old). While we have worked hard to make sure she tries all types of foods with different flavors and textures, I have to say, I was shocked to see how much soup she vacuumed up. Then I tasted it. Well, of course. 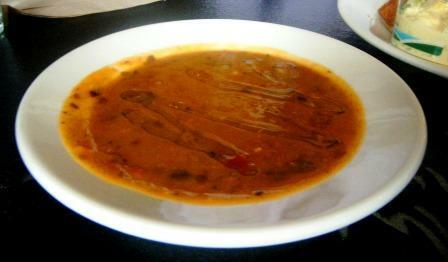 It’s a fantastic combination: silky pumpkin with perfectly cooked and seasoned black beans. What’s not to love? I am no stranger to Flying J Farms beef. It’s some of the best we’ve tasted. 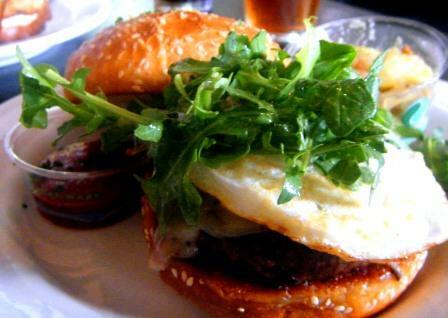 I had to order the Diner Burger: made with ground beef from Flying J Farm‘s grass-fed and finished cows, on grilled brioche, topped with fontina, a fried egg and peppery arugula. The egg still had a delicious thick yolkiness, that further “sauced” the burger (and my shirt, since Persephone is nothing if not a graceful eater). It was tremendously good. But what really set it off was the lovely tomato marmalade. In a word: finesse. 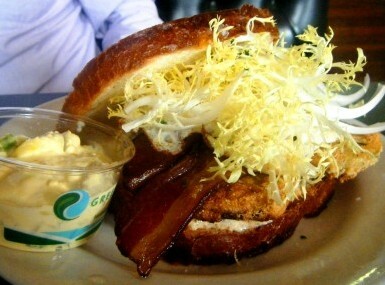 Hades ordered the Fried Green Tomato BLT, topped with a fried yard egg, a pretty ruffle of frisee and oo-wee sauce. 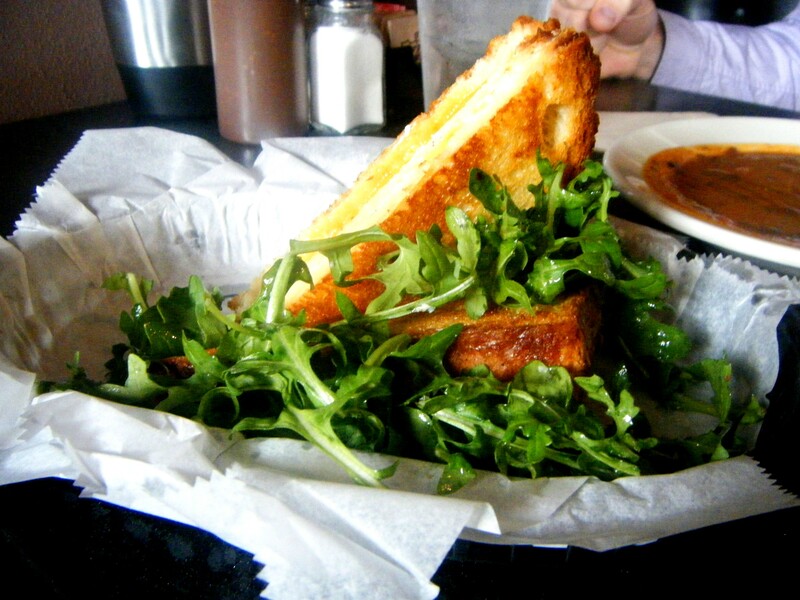 Let me tell you: oo-wee, it’s good sauce and a good sandwich. I think fried green tomatoes can be kind of pain to do right. And Chef Caskey does them right. Nice, thick, meaty tomato (you can easily screw them up and make them mushy, not so here), along with thick, meaty bacon made a wonderful fare-the-well to summer sandwich. Both Hades and I had small sides of different, but perfectly paired, potato salads. His a homestyle and mine a cold German-style. All sandwiches were $9. Not much for locally sourced, creatively conceived and downright delicious fare. I really do love this restaurant. It’s the kind of place that if we go out, which is rarely, we want to go here. Make sure you visit them this week.